London in the summer is a great place to be. It is buzzing, scenic, cultural and vibrant. 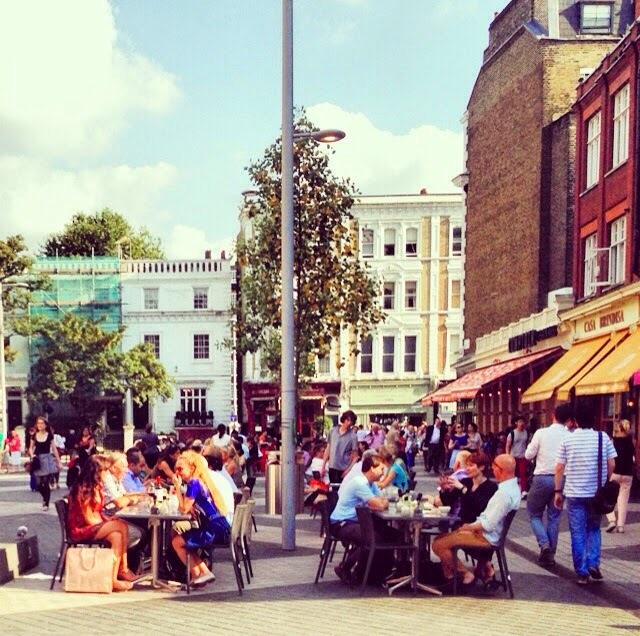 Finding a great place to sit, eat and people-watch is key to soaking up the atmosphere of this great capital. The abptly named Exhibition Road, in South Kensington is a fantastic place to do all of the above as it is the middle of an arts and culture hot spot. 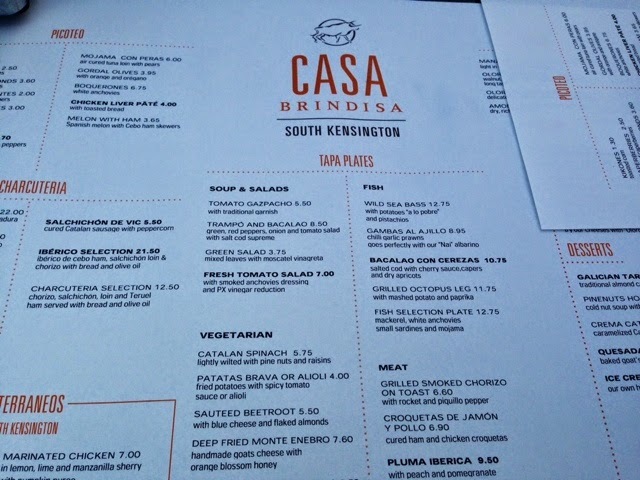 I was there the other day for some dinner with friends after visiting the V&A museum (See The pursuit of...Wedding dresses V&A Exhibition) and we decided to eat at Casa Brindisa, a Spanish Tapas restaurant. As we arrived at peak time, we were very lucky to snare a table outside, where we could enjoy the glorious sunshine. I really felt like I was back on my holidays in Seville as we perused the Spanish delicacies on the menu whilst taking in the sights of this bustling pedestrianised square. 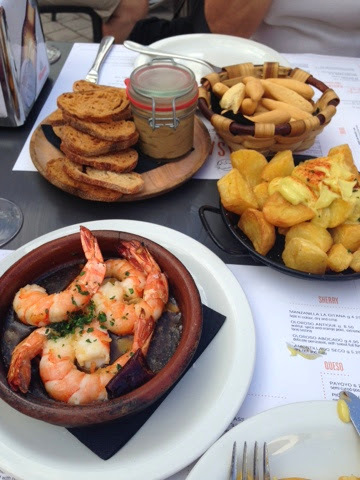 Our lovely waiter ensured we were comfortable and recommended some tapas for us to share. 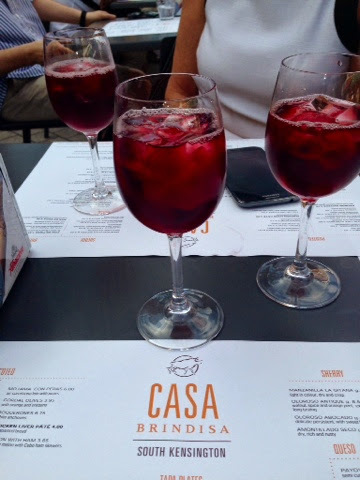 As one of my friends is Spanish, we let him choose for us and started with a lovely refreshing 'Tinto de Verano', an authentic Spanish wine cocktail of red wine mixed with a lemon/lime soda, such as sprite or 7-up. 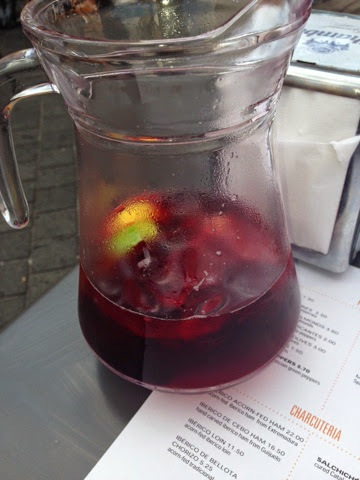 I adored this drink when I was in Seville so I was very pleased to see that they served it here (below). 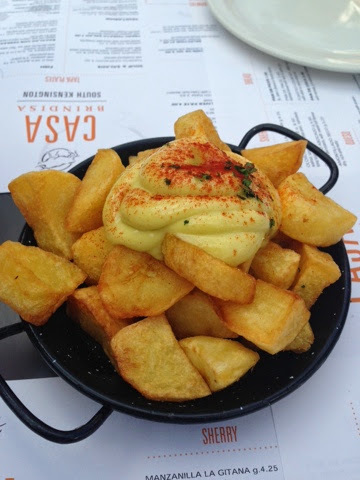 Patatas Alioli (Fried potatoes with a garlic mayonnaise) It was absolutely divine (below). 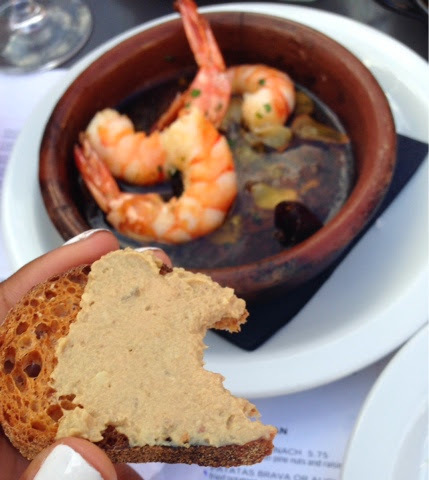 Chicken liver pâté with toasted bread, Gambas Al Ajillo (Chilli garlic prawns), Picos (Breadsticks)...all so delicious! (Below). 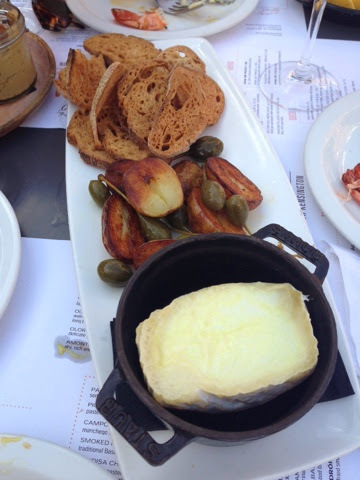 Torta De Cañarejal (Warmed semi soft cheese with potatoes and caper berries). 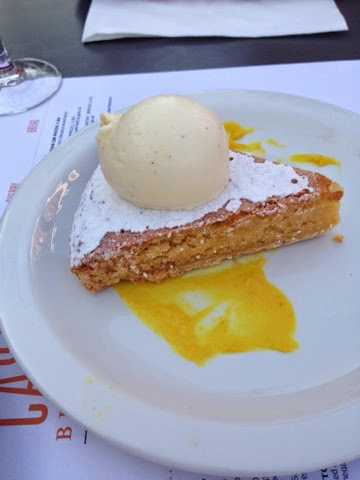 ......and for dessert, the three of us shared this Galician Tarta De Santiago (Traditional almond cake served with vanilla icecream) - mouth-wateringly yummy!! 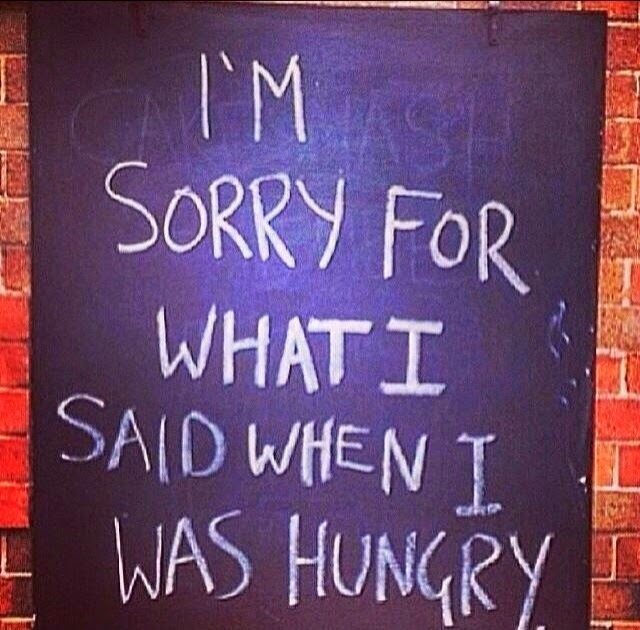 Our waiter was very attentive and didn't rush us at all considering it was a very busy evening. We ended up chatting and eating away for a good couple of hours. I would definitely go back again as there is lots more on the menu I'd love to try and it is in a prime spot on Exhibition Road for soaking up all the atmosphere and surroundings. After dinner, I parted with my friends and decided to have a little wonder around this lovely part of town. I stumbled upon this little bookstore (above) which was crammed to the rafters with great literature titles. I love a good bookstore, especially an independent one. 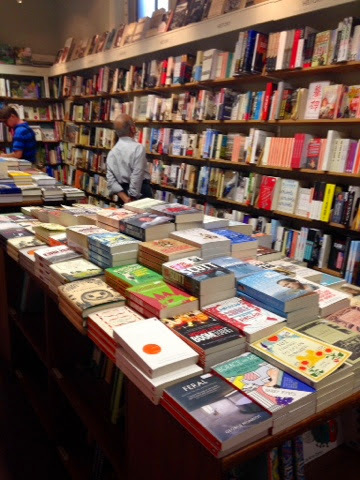 I always feel peaceful and stress-free when surrounded by books and could quite easily spend a few hours in one. 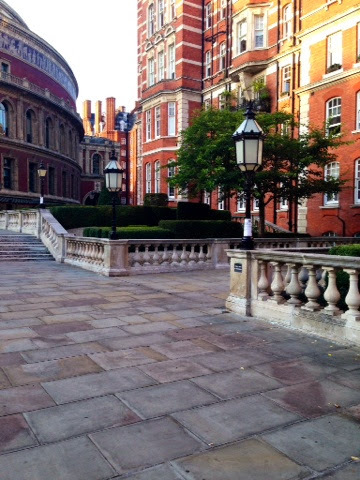 The Royal Albert Hall is very close to Exhibition Road and I took a lovely scenic walk, passing The Natural History and Science Museums on the way. 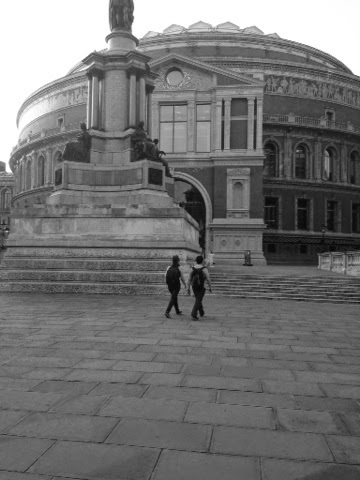 I then finally took a pew on the steps of Kensington Gardens looking out at the front of the Royal Albert Hall. 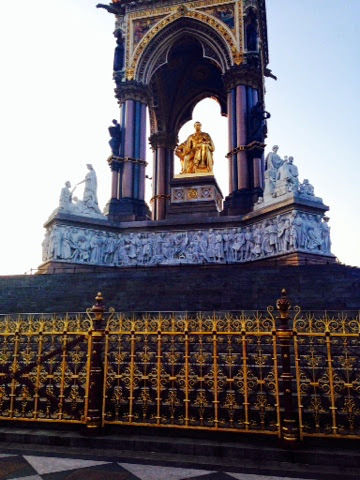 What a view!....I had the magnificient ornate monument behind me (above) and a great view of the front of the Albert Hall. There were lots of people just sitting, taking pictures, working and just generally enjoying the warm summer evening. 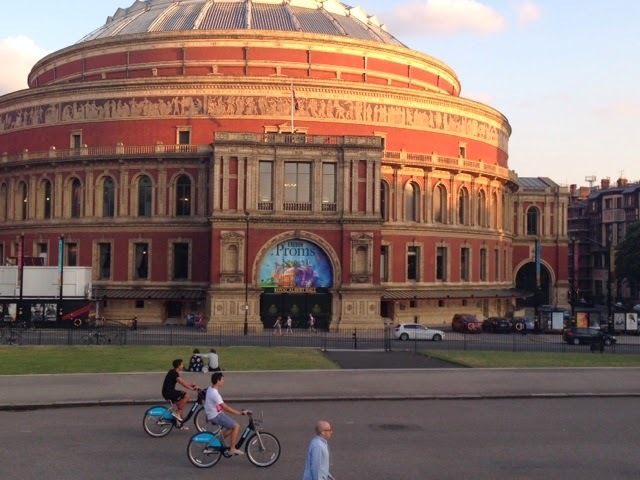 The world-famous BBC proms is currently showing at the moment at the hall until the 13th September. I may try and get tickets for one of the performances to experience it all this year. I am gutted as their was a special Late Night Prom with Paloma Faith that would have been right up my street as I love her retro, jazz voice....it's currently sold out for this performance but I can just imagine seeing her live with a 42-piece jazz orchestra - that would have been amazing. The hugely sought after tickets for Last Night Of The Proms is being allocated by ballot this year due to the large numbers of people who want to attend. This is definitely something I would like to go to one year. London has something for everyone. I am always surprised by the little hidden corners and gems that I stumble across just by taking a leisurely stroll through the city. Even better would be to hire a 'Boris Bike' where you can really experience and see London for all it has......if you're brave! !